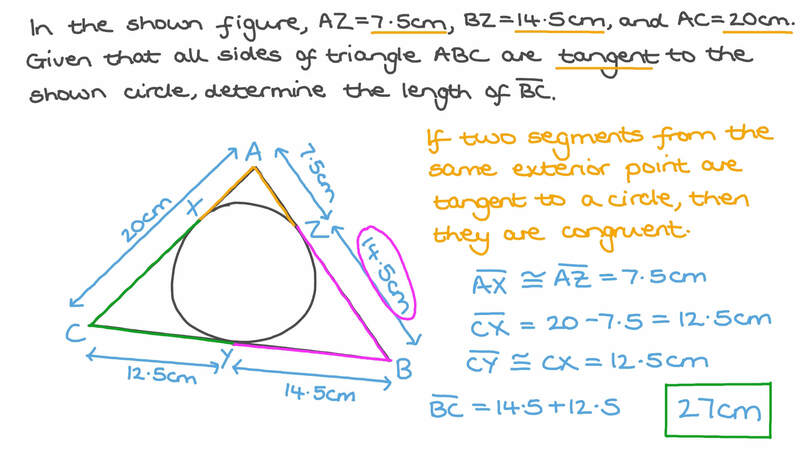 In this lesson, we will learn how to identify circumscribed polygons and how to solve problems involving them. Is the following statement true or false? In a circle, all of the inscribed angles which intercept the same arc are equal. In the shown figure, 𝐴 𝑍 = 7 . 5 c m , 𝐵 𝑍 = 1 4 . 5 c m , and 𝐴 𝐶 = 2 0 c m . Given that all sides of triangle 𝐴 𝐵 𝐶 are tangent to the shown circle, determine the length of 𝐵 𝐶 . Find the perimeter of the △ 𝐴 𝐵 𝐶 . Find the lengths of 𝐷 𝐵 and 𝐸 𝐶 . In the following figure, find the perimeter of the square given that the length of the circle’s radius . Which of the following diagrams shows a circumscribed polygon? A regular pentagon is circumscribed around a circle of radius 2 cm. Find the length of one side of the pentagon. Give your answer correct to one decimal place. In the figure, 𝑟 = 5 0 c m , 𝐴 𝐵 = 9 7 c m , and 𝐶 𝐷 = 1 0 9 c m . Find the perimeter and the area of 𝐴 𝐵 𝐶 𝐷 . Given that 𝐴 𝐵 𝐶 is an equilateral triangle whose sides touch circle 𝑀 and that the coordinates of point 𝐵 are ( − 7 , 0 ) , determine the equation of circle 𝑀 . The circle centre 𝑃 is inscribed in the equilateral triangle 𝐿 𝑀 𝑁 of side 63. What is the circumference of the circle? In a triangle 𝑋 𝑌 𝑍 , 𝑋 𝑌 = 5 c m , 𝑋 𝑍 = 3 c m , and 𝑌 𝑍 = 4 c m . A circle with centre 𝑀 is drawn so that 𝑀 𝑍 is a radius and 𝑋 𝑌 is bisected at 𝑀 . Find the length of the diameter. In the shown figure, 𝐴 𝑍 = 7 . 5 c m , 𝐵 𝑍 = 1 3 . 5 c m , and 𝐴 𝐶 = 1 9 c m . Given that all sides of triangle 𝐴 𝐵 𝐶 are tangent to the shown circle, determine the length of 𝐵 𝐶 .